The raw dog food diet attempts to replicate the wolf's diet, which consists primarily of meat, organs and bone but also includes the fruits and vegetables often found in the stomach of prey. Dry dog kibble is like cereal, says Colleen Smith, doctor of veterinarian medicine at Chattanooga Holistic Animal Institute. And would you feed your children only cereal? "If Fruit Loops were all you ate, you could survive, but you're surviving, not thriving," Smith says. When it comes to food, Americans are becoming more conscious, and just as parents have traded their children's sugary cereals for more balanced alternatives, pet owners are elevating their dogs' diets, too. The problem with a diet of conventional dry dog kibble is that 50 percent of its ingredients are carbohydrates, Smith says. Meat is expensive, she explains, so companies often use rice, corn or legumes as filler. "We're feeding dogs like omnivores, but they're really just wolves in different pajamas," Smith says. In fact, she continues, genetically speaking, the domestic dog is 99 percent identical to the gray wolf. So, shouldn't they be eating more like their ancestors? The question was posed in 1993 by Ian Billinghurst, Australian veterinarian and author of the book "Give Your Dog a Bone," in which he introduced the idea of the raw dog food diet, also known as the prey model diet. However, it is not as simple as plopping uncooked ingredients into a dog bowl. For starters, sourcing ingredients such as organ meat or bone meal can be tricky for those who want to make their dog's diet from scratch, Smith says. 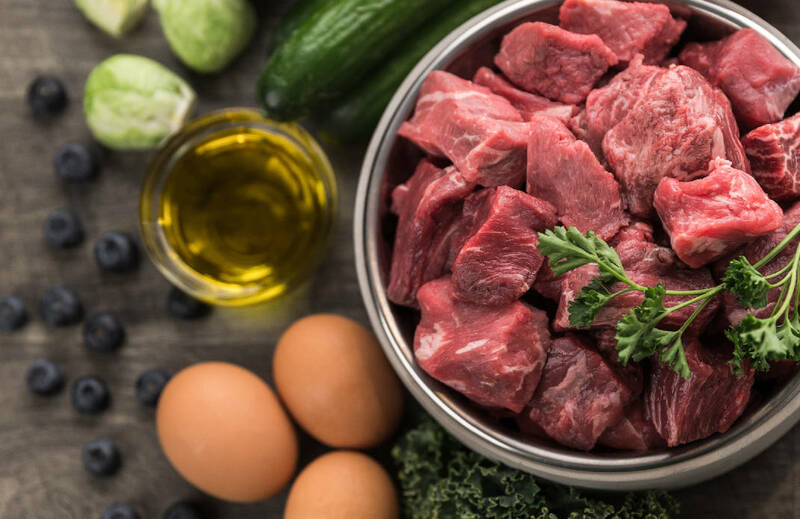 Moreover, raw meats may contain harmful bacteria such as salmonella, listeria and E. coli, and the resultant risk of contamination has created controversy around the pet food fad. The U.S. Centers for Disease Control and Prevention does not recommend raw diets for pets due to the health risks. The American Veterinary Medical Association is more lenient, stating on its website that while it discourages raw pet diets that have not undergone a pathogen-eliminating process (i.e. cooking), it recognizes that new technologies are constantly improving the safety of commercial raw diets. Yet amid the debate, the raw diet is an ever-increasing trend. "When we opened [in 2012], we started with a single freezer door for our raw food," says Caitlin Jones, assistant manager of Nooga Paws. In 2017, the North Chattanooga pet store added two more freezers to accommodate the growing demand. This year, it expanded its selection again, debuting an eight-door walk-in freezer boasting 12 different brands of raw pet food. The commercial raw foods offered at Nooga Paws are made using different mixtures of raw meats such as chicken, bison, lamb or fish; organ meats such as kidneys or livers; bone meal; vegetables; and fruit. Among its 12 brands, store owner Bob Poore says 10 underwent high-pressure processing, a practice in which raw meats are highly pressurized in cold water. "Basically, it squeezes out all the bad bacteria, primarily salmonella and listeria," Poore explains. While dogs still require the same basic nutrition as wolves, over the millennia, their stomachs — like humans' — have become less resistant to pathogens found in raw meats. So before pet owners answer their dog's call of the wild and switch to raw diets, they should first consult with their veterinarian. After all, "Food is medicine," Smith says. "Variety and balance is really important. It is the foundation of health."